Only American Society of Home Inspectors (ASHI) Certified Inspectors (ACI) have a Home Buyers Bill of Rights. This is a pledge to protect your interest in your real estate transaction. 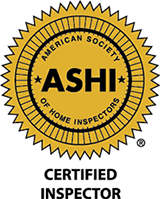 An ASHI Certified Lakes Area Home Inspector follows both the ASHI and State Ethical Standards of Practice. Compliance with both ethical standards and professional standards assure that the Lakes Area Home Inspector on your next transaction is working hard to provide you a great inspection and deal professionally with all other parties in the transaction.